This can be ridden as a one-way shuttle either way or as an out and back either way. I have listed it as an out and back. This trail has sooooooo much potential, but the last time I rode it or I should say "hiked it", the deadfall on the Nukht trail was unbelievable. It's probably not worth the effort at this time. Beautiful area though. 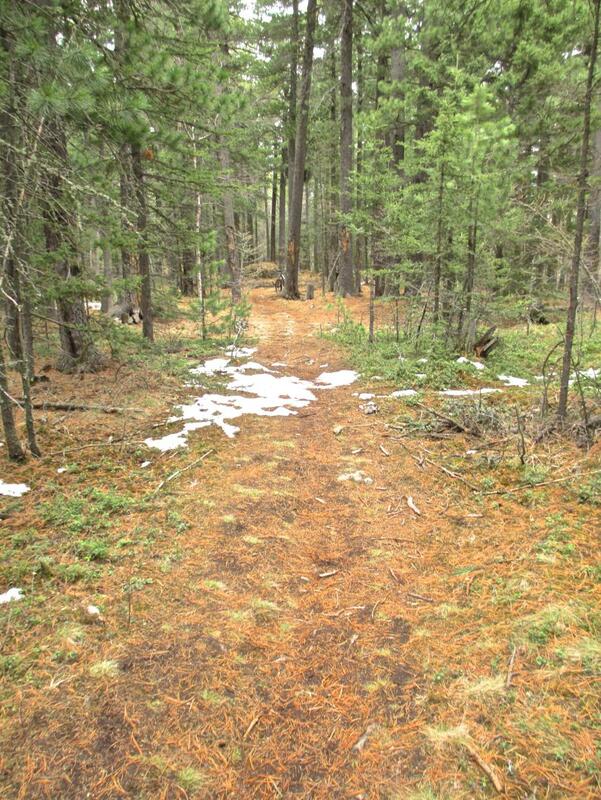 Before I bring my bike again, I will hike or run it to check the condition of the Nukht trail. Review: In its current condition I have to rate this trail a 2, but it has the potential of a 5. This is gorgeous beautiful country, and there is ample topography and elevation for some awesome riding. But the deadfall on the Nukht Valley Trail makes it unrideable over a substantial distance. Last May I "rode" the trail from Nukht to Zaisan. It wasn't much of a ride except for the first mile up the Zaisan Valley Trail, and the last 2.5 mi down the Zaisan Chutes Trail (exceptional riding). It was tough going for quite a while with all the deadfall plus all the water from the spring melt coming off the mountain EVERYWHERE in Nukht valley. I finally had to bail out of the route I was taking, throw my bike on my back, and climb out a long exposed slope (about a 1000' ascent) of sustained 30-50% slope. Once on top the riding was still slow for a long time. Although the day did not go as planned, I had an awesome time. The weather "elements" were really cool with a low pressure system moving through the area and snowing on me a couple of times. The nature was beautiful. Plus, I watched 4 eagles (2 pairs) dance and play together directly above me for about 15 minutes. And finally, this was the day I discovered the Zaisan Chutes at the end of the ride ... what a way to end the day!!!!!!!!!! Pure DH bliss. It took me nearly 4 hours to do the 11.5 km on the trail. Once in Zaisan, I rode home through the rush hour traffic in UB. I couldn't help but think how different the commuters' day and my day had been. Mine FAR better. Nukht to Zaisan MTB Trail 3.00 out of 5 based on 1 ratings. 1 user reviews.